Seeing through the canopy: New discoveries are being made at the ancient Maya center of El Pilar, using cutting-edge technology. El Pilar. 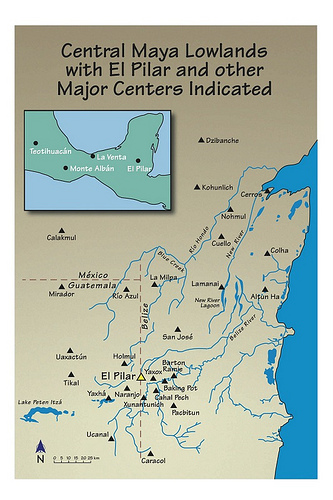 The name means "watering basin", reflecting its rich water resources.Spread across the border between western Belize and northeastern Guatemala, this ancient Maya city center is considered the largest site in the Belize River region, boasting over 25 known plazas and hundreds of other structures, covering an area of about 120 acres. Monumental construction at El Pilar began in the Middle Preclassic period, around 800 BCE, and at its height centuries later it harbored more than 20,000 people. It thus may come as a surprise for many visitors when they actually see the site. Its immensity belies the view -- for this city, unlike many of its well-known counterparts in Belize and Guatemala -- sites like Tikal and Caracol -- remains mostly cloaked in its dense tropical shroud. With the exception of a fully exposed Maya house structure, pyramidal temples appear as hills covered with vegetation and trees, ball courts are still disguised like natural extensions of the jungle landscape, and elite residential buildings are detectable only as mere rises beneath the forest canopy. But this is not because archaeologists have not had the opportunity to excavate the site like they have at the famous tourist-draws of Tikal or Caracol. It is actually by design. At El Pilar, conservation is foremost, and the concept, known as "Archaeology Under the Canopy" says that the monuments are best protected beneath the forest foliage. The objective is thus to selectively and partially expose only strategic areas, features that would visually demonstrate essential knowledge about the site. In addition, in keeping with the focus at El Pilar on researching Maya lifeways (as opposed to the lives and remains of rulers and elites), the site is both an open-air laboratory and showcase for learning about and demonstrating the traditional Maya agricultural practice of forest gardening, a methodology for sustainability thought to be a key to the prosperity and florescence of the Maya civilization. Now, consistent with its pioneering place in Maya studies, El Pilar has become the focus of a new frontier in Maya archaeology -- one that promises to revolutionize the way archaeologists and other specialists approach the discovery process at archaeological sites and areas. Archaeological survey in the verdant tropical Maya forest has presented long-standing challenges to finding undiscovered archaeological sites. The dense foliage and forest canopy have made sure of that. Partly because of this and other research priorities, traditional mapping strategies have involved focused surveys of specific areas, usually around major centers, such as Tikal, and only later in areas outside of centers, such as my work between Tikal and Yaxhá. These settlement data have given us samples of ancient landscapes that can be projected across broader areas, as I have done with GIS (Geographic Information Systems). While traditional survey techniques have provided results in spite of the constraints of the dense forest, new and cutting edge technology, called LiDAR, may be a game-changer for archaeology in tropical areas. LiDAR (Light Detection And Ranging) is a laser-based remote sensing method that uses light in the form of a pulsed laser to measure ranges, or variable distances, to the Earth. It is capable of penetrating overlying vegetation and forest canopies, imaging at very high spatial resolutions with extraordinary accuracy. These light pulses, combined with other data recorded by airborne systems, produce precise points in a three-dimensional space to create a "point cloud" image for mapping. The technique was first applied in Maya archaeological research by University of Central Florida anthropologists Arlen and Diane Chase to produce 3-D maps of Caracol in 2010. In a recent publication of the Proceedings of the National Academy of Sciences, Chase and others have argued that LiDAR is poised to generate a fundamental shift in Mesoamerican archaeology, potentially transforming research in forested areas worldwide. Using this technology, we can now readily identify structures such as hidden temples and locate them precisely on the landscape with extraordinary spatial precision. Is this the new magic wand? How will archaeologists integrate this new tool? What is its potential for discovery? Prior to LiDAR, many of the secrets of ancient Maya settlements remained hidden from view. Now, with LiDAR, large and small structures previously undetected can be made initially visible without traditional surveying, clearing and excavation. Successful identification of built structures from LiDAR, however, depends on the use of robust interpretive algorithms to extract terrain features from the data “point cloud”. In other words, LiDAR results must be decoded to interpret cultural elements, and this is a work in progress. Inspection of the visualization results provides the “targets” for validation. These can be obvious residential compounds, suspected monuments, and more subtle features of small structures, depressions, and quarries. Validation in the field is critical to build the strategies for detecting the cultural features, and we need to look at all types of features, both those we think are positive ancient characteristics, as well as ambiguous or negative elements. El Pilar is an ideal location for developing a new field study protocol to integrate the LiDAR technology with traditional field survey. We have been working at the site for over 20 years and have mapped the major architecture. Human activities have had little subsequent impact on the Maya forest around the site since the abandonment of the Classic Maya infrastructure around CE 900. Now a binational protected area in Belize and Guatemala, there is a need for an understanding of the cultural remains as part of the management planning process. Thus, the results of our new validation project of the LiDAR imagery will not only develop a comprehensive map of the Maya landscape of El Pilar for research, but will also provide vital input for the adaptive management of the site in Belize and Guatemala. Exploring Solutions Past ~The Maya Forest Alliance, a conservation and sustainability organization based at the University of California, Santa Barbara (UCSB), recently received a gift from Mayaniquel, S.A., a Guatemalan company, of airborne LiDAR imagery covering the entire 20 sq km area of the El Pilar Archaeological Reserve. At the highest resolution of c. 20 laser pulses per sq m, imaged from a helicopter, data were gathered on forest canopy (height and density) and ground surface into an enormous "point cloud" data set that incorporated all of the observations. We have processed the LiDAR data using Terrascan and custom feature extraction software. We have used these images to target potential positive cultural features, questionable elements, as well as negative areas at El Pilar. The 2012 two-month season was aimed at building a field validation scheme and a protocol for moving from the LiDAR imagery in the context of the GIS to the field using GPS devices. We focused on a detailed area of c. 2 sq km in the core of the city. Based on the LiDAR, we prepared targets for the field validations. This included feature classifications as built structures, liner alignments, ambiguous objects, and irregular surfaces. In the field, we assembled coordinates based on the LiDAR features. These coordinates were input into the GPS and used to navigate to the actual targets. Once we arrived at the features, we verified their qualities, confirming Maya structures with sketch maps. Nehanda Higinio, a Belizean environmental studies student working with the El Pilar program in Belize, participated in the field work to identify the actual ground features detected by LiDAR. Below, she briefly describes her experience. Using the GPS tracking system to find locations identified with LiDAR technology, we marked and recorded the different points that were house platforms and limestone quarries, places that the Maya mined for building stone. The slopes were as many as the land snail shells that lay scattered about among pieces of ancient Maya pottery and the fallen leaves from Allspice, Corozol, Ramon and Copal trees………It was like putting together the pieces of a puzzle. We looked at our LiDAR map then walked to the actual physical location using a GPS tracking device. When we got to each point we looked at our LiDAR map to see if what we thought we saw on the map was what we could actually see in real life. We had to also collect notes to describe the area’s density of rainforest and the trees there were identified by Master Forest Gardener Torres. This helped in confirming the data from the LiDAR map.